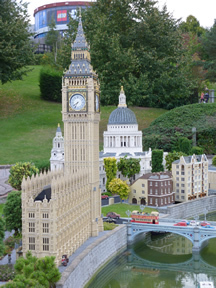 My Legoland Windsor Holiday Review. Our Legoland trip was booked through the main Legoland website and we did not stay in the on-site Lego Hotel but instead we stayed at the local Holiday Inn in Slough, Windsor on a bed and breakfast basis. We made use of the buy one day get the next day free, so we had 2 days at Legoland Windsor. When you arrive there are 4 main car parks; A, B, C and D. These car parks cost £4 per day, and you can pay cash at the gates when you leave. There is also a car park at the Lego hotel which is free if you are staying there. You then walk to the entrance, and if you have pre-printed your own tickets, just go through the middle of the entrance and then scan your own tickets or annual pass etc. Make sure you pick up a paper map here as well. Although there is a Legoland App available, which has lots of useful information - as well a map on it. At the entrance are the main Lego shops and toilets, but there are numerous Lego shops scattered around the whole site so you are never far away from buying Lego! You can enter Legoland through the turnstiles from 9.30am, but if you are not an annual pass holder or staying at the Lego hotel then you will have to wait until 10am before you are allowed to go onto the rides. We started our first day by going to the Imagination Theatre, where they play several different 10 minute 4D films - which contain fire, smoke, water and wind effects. We saw 2 of these films and they were both very good. Just turn up 10 minutes before they start, playing times are on the paper map. We next moved our way around the site trying all the various rides. We went on a weekend in September, once the schools had gone back. The weather was still very good and Legoland was still very busy. But we found that we managed to fit in lots of rides between 3-6pm when it got quieter, (the Legoland opening times at the weekend are 10am until 6pm). Sunday definitely seemed quieter than the Saturday. On Saturday it took us 30 minutes to get out of the car park, but on Sunday evening we got out in about 5 minutes. Our longest queue time was for Atlantis and the Boating school both of which seemed always busy. We spent about 30 minutes queueing for these. Do prepare to get wet if you go on the Vikings River Splash, Squid surfers, Pirate Falls or Raft Racers. There is also the chance of getting wet if you sit in the wet section whilst watching the Pirates of Skeleton Bay stunt show. 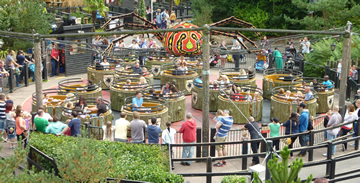 There were lots of rides to go on, for both children and adults. Over two days we stayed all day but we did manage to do most of the rides, we even went on some more than 3 times. The Star Wars miniland model display was very good, I especially liked the Millenium Falcon display which moved up and down out of Mos Eisley spaceport. Here you will also find the Lego Star Wars shop. If you want to let your children play in the Duplo water park area, there are changing rooms and lockers available. With so much to see and do, look no further than LEGOLAND Holidays for all your family holiday needs. They offer you LEGOLAND tickets with a 2nd Day FREE, a stay at a top family-friendly hotel including the LEGOLAND Resort Hotel packed with exciting LEGO features and a delicious breakfast in every package. You can book your Legoland tickets direct and see how much you can save at the Legoland UK official website. Don't forget about the special Legoland events like Brick ot Treat Halloween Legoland event or the Legoland Fireworks event.